How are you today? My week is starting with a pleasant surprise, I just got home from work and had this beauty waiting for me in the mail, isn’t that great? It could not have been a bigger coincidence because today I’m scheduled to receive Robin Helm with a guest post of A Very Austen Valentine and share a vignettte of a sequel she wrote for her story I Dream of You as well as an excerpt from Sir Walter Takes a Wife by Laura Hile. I already started reading this book and I’m loving it, but it will be even better to finish reading it in the paperback format. I expect to bring a review to you shortly, but until then, I hope you enjoy what we brought to you today. Faced with a lonely future and finding himself strapped for cash, Persuasion‘s Sir Walter Elliot manfully decides to marry again. But his careful plans go sadly awry! A lighthearted Valentine mash-up featuring two of Jane Austen’s worst snobs. In this Persuasion alteration, Anne is so altered by Wentworth’s love in the summer of 1806, she refuses to give him up when both her godmother and father try to persuade her. “The Lovers’ Ruse” follows Frederick and Anne through their whirlwind courtship and their secret engagement. When Wentworth returns for his Annie girl, the cat comes out of the bag. I must admit to being a huge fan of my original character, Lord Thaddeus, better known as the epitome of male beauty, the heartthrob physician, hero who flouts convention, Thaddeus Beckett. I first wrote him as Darcy’s competition in More to Love, which I hope to release in February or March. Elizabeth called Beckett an angel, and then referred to him as Apollo, the Greek god of music, truth and prophecy, healing, the sun and light, plague, poetry, and more, I readily admite, for a good while, I wanted him to win Elizabeth’s heart. However, I knew that would raise a storm in JAFFdom, so I relented. Poor man was called away on an emergency. As he wasn’t there to press his suit, Hercules (Darcy) swooped in, claiming the advantage, and won in the end. Then I re-introduced Beckett as a love interest for Mary in my work-in-progress Maestro, but I fear he may not win her hand, either. Alessandro Landini, the devastatingly handsome Italian musical genius will be tough to beat. Mary, after all, loves music above all else, and Landini is her pianoforte teacher. Maybe if Landini slips up, Beckett can take his place. It would help if he could play and sing. I’m going to work on that. Therefore, I started writing I Dream of You for A Very Austen Valentine, using one shots and shorts that I wrote long ago. Again, the good doctor, Thaddeus Beckett, was mentioned, but he didn’t make an actual appearance (though I did introduce another original character – Mr. Anderson). Since I can’t seem to let go of the tall, blond, handsome doctor, I’m going to give him a book in 2020. His story will be the first in The Beckett Brothers series. Until then, I have written a vignette for the good doctor, giving the lovely man a sighting at the end of I Dream of You. His services will be needed for a most important medical procedure. Perhaps it’s time for you readers to get to know Beckett. I promise, you’ll love him. Sir Walter Elliot’s Valentine card was sent by mistake to the wrong Lady Catherine, a faux pas of monstrous proportions. However, after seeing Rosings Park pictured in his copy of The Grand Estates Guidebook, Sir Walter journeys to Hunsford to investigate. As luck would have it, he is asked to dinner by the rector. Mr. Collins was happy to talk—about nothing and everything. Apparently the man was extremely fond of food. He carved the roast with gusto and described for Sir Walter’s benefit each dish that was brought to the table. He ate and he ate, until Sir Walter feared the buttons on his waistcoat might pop off! On the other hand, his unrelenting praise for the provider of his living gave Sir Walter much useful information. “You don’t say,” said Sir Walter politely. Which only showed how hideously bored she must be. The poor woman needed a change of scene. Mr. Collins’s pink cheeks grew pinker still, and he described at length the excellent renovations made to the kitchens. Sir Walter passed the wine bottle, and Collins again refilled his glass. To Sir Walter, this was a truly thrilling detail, for it indicated good taste as well as largesse. Any woman who would spend that much for a chimney-piece was just the wife for him. 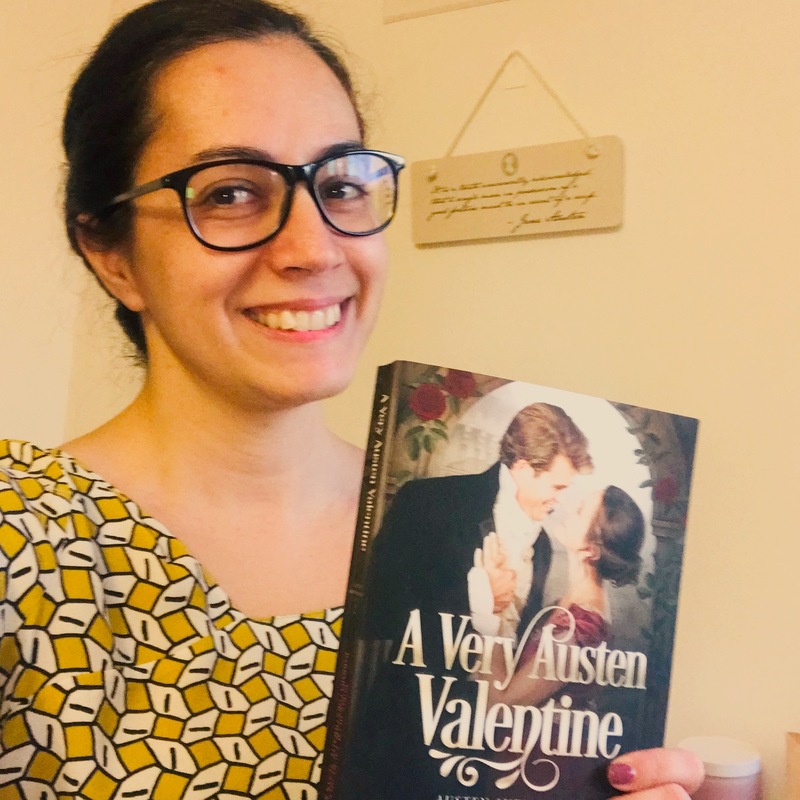 These talented ladies are offering a very generous giveaway during the blog tour, they are offering ten eBooks of A Very Austen Valentine: Austen Anthologies, Book 2. This giveaway is international and all you have to do to apply is click here. 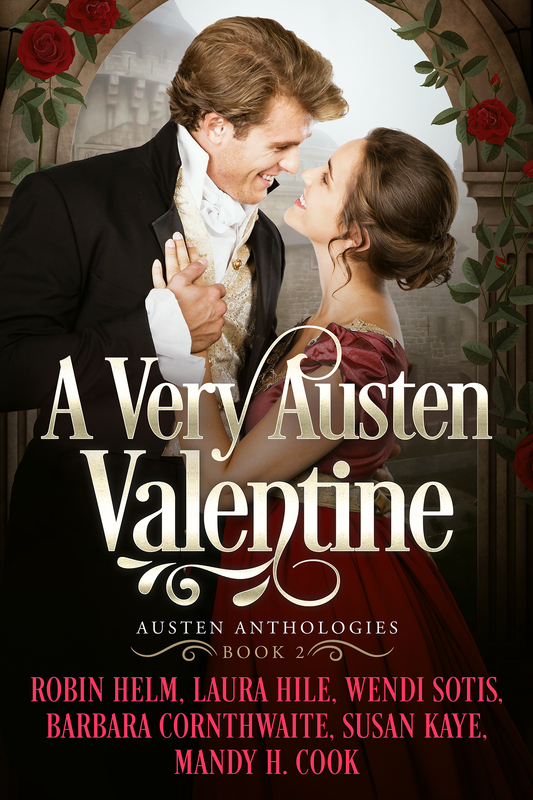 They are also offering a US only paperback copy of A Very Austen Valentine: Austen Anthologies, Book 2. You may click on the same link, but don’t forget this will only be valid it if you have a US address. Thank you, dholcomb1! The combination of an excerpt, a guest post, and a vignette was a really fun idea. Rita did an absolutely wonderful job! Good luck in the giveaway! Thanks for commenting, dholcomb1! Good luck in the giveaway! Love the excerpt about Elizabeth and Darcy, and, Sir Walter deserves Lady Catherine! So glad you liked it, evamedmonds. I agree. Sir Walter and Lady Catherine deserve each other! Good luck! I loved the Darcy baby story. I do love it when Darcy insists on staying with Elizabeth while she gives birth. He’s so proud of his beautiful wife and son. Thank you for sharing these excerpts – I think Sir Walter and Lady Catherine deserve each other! I look forward to your review Rita. I just couldn’t see that ending any other way. The Darcy I love would stay with his wife, especially knowing that his mother died in childbirth. He would do what Elizabeth wanted him to do, and he would make sure she was okay. I totally agree about Sir Walter and Lady Catherine. That’s a match made in – well, made somewhere that’s certainly not heaven. I look forward to the review, too! Good luck in the giveaway! Hi Glynis, Thanks for commenting. I’m glad you found a way to enter. Good luck! Would you believe that I treated myself to this book today? Yip! It’s being nominated for the Austenesque Group read for January and I must admit to really looking forward to delving into each one of the stories. I didn’t read the excerpts you posted as I’d prefer to read the book without any prior sneak peaks!! Looking forward to reading your thoughts on it! Mary, this book is a treat, because there is something for everyone here. My reading friends — like you! — get to meet my writing friends. Do enter the giveaway. If you win, we will gladly gift the prize eBook to one of your friends. Enjoyed the excerpts. I liked that Darcy stayed with Elizabeth and am glad to see Sir Walter get his own story in this anthology. Sir Walter has been wanting his own story for a l-o-o-n-g time, darcybennett. I caved and allowed him to write an advice book (Marrying Well For Fun and Profit), but he wanted more. My anthology contribution is the result. Congratulations to all the authors and thank you for the chance to win a copy. Virginia, thanks for entering our giveaway. Robin hit one out of the park with this vignette — wow! The neat thing about these anthologies is that I get to be both a contributor and also a fan. Oh-My-Gosh!! Those excerpts were amazing. First, congratulations on the launch of this and for being the Group Read choice over on GoodReads. That will be fun watching everyone discuss it. That excerpt of Darcy being with Elizabeth during the birth of their child was so cute. The other excerpt with the wrong Lady Catherine… only Sir Walter. The should be fun to read. What a hoot. Next, what is to be done for Lord Thaddeus Beckett? You have tried to pair him with just about everyone. What about Georgiana? Is he too old for her? He’s a Lord. Too bad Charlotte isn’t free. Had Collins married Mary, then Charlotte could be visiting Lizzy… oh well. You’ll find someone for him. I kind of like him. He behaved himself during the delivery and that was nice. Blessings on the success of this work and thanks for the generous giveaway. Thanks, Rita for hosting. Robin outdid herself with the vignette. For my part, I merely let Sir Walter out of the box. Suddenly I found him plying Mr. Collins with wine and flattery, dratted man! Hi, J. W. Garrett! I have plans for Beckett, so don’t worry about the lovely man. I won’t let him go to waste. I’m very excited about the group read. Even being nominated is an honor. Oh, you do tease us with these excerpts! Looking forward to reading the rest of these stories by some outstanding authors. Forever, your comment makes me smile — just as our stories in this anthology are meant to make you smile. Thanks for the kind words. Good luck in the giveaway! Music to our ears, ForeverHis! I hope you enjoy the stories. Good luck in the giveaway! I loved the excerpts, I’m looking forward to reading this anthology. Congratulations ladies. Hi, Kate! So glad you liked the excerpts, and I hope you enjoy reading the book. Lady Cathterine and Sir Walter deserve each other. Love the relationship between Darcy and Elizabeth. Thank you for the generous give away. They kind of do, debora. I had way too much fun writing them. 🙂 Good luck in the giveaway. I agree, deborahanne2. Those two definitely deserve each other. I love their relationship, too. In my mind, he wasn’t a typical Regency society husband. You’re most welcome. Good luck! What lovely excerpts. I really enjoyed Darcy and Elizabeth’s story of the birth of their child. Thank you for the chance in this generous giveaway. I did read that my Goodread friends are doing a group read. Excited to read their thoughts. Hi, Shelley! Thank you for the compliments. I hope you enjoy the stories! Good luck in the giveaway. Oh I am so glad Laura talked you into a full novel of the swoon-worthy Dr. Thaddeus! Loved the excerpt of Darcy being a part of the birthing. I’m surprised he allowed Thaddeus to be the doctor!! Laura, little does Sir Walter realize that Mr. Collins doesn’t need extra wine to talk about Lady Catherine! That was fun! Thank you for a chance at the giveaway! Good luck in the giveaway! It won’t be long now. I think the Rafflecopter thingy said 32 hours? Woo hoo! I feel so hurt that no one told me there is a whole world of Austen waiting for me in the blog world! These books are totally new to me. If you subscribe to Kindle Unlimited, Dianna, you’ll have more book love than you can handle! Thanks for coming by, and good luck in the giveaway!